Not surprisingly, Panasonic announced three new lenses for the L-Mount system so photographers have something to put in front of their new Lumix S1 and S1R bodies. The new L-mount optics are the Lumix S 24-105mm f/4 Macro OIS, which will serve as a ‘kit lens’ (though not cheap at $1899); the Lumix S Pro 70-200mm f/4 OIS (S-R70200) and the Lumix S PRO 50mm f/1.4 (S-X50). All three lenses are dust and splash-resistant and can be used in temperatures down to -10 degrees Celsius. The 24-105mm and 70-200mm work in tandem with the new cameras’ 5-Axis stabilisation system, for up to 6 stops of shake correction. 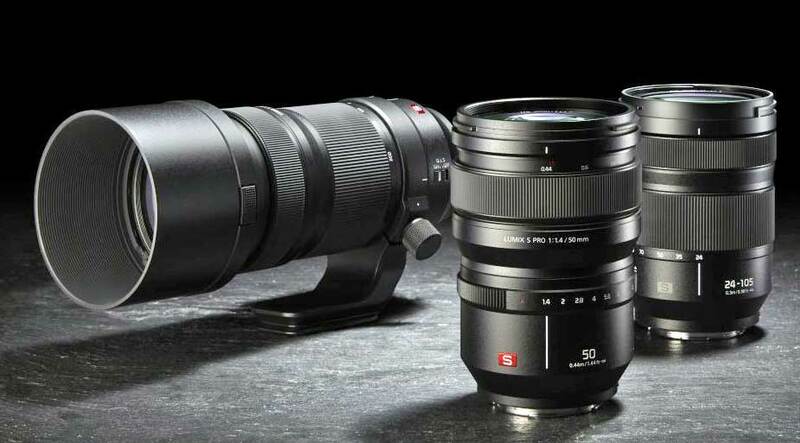 The new L-Mount, adopted by the L-Mount Alliance manufacturers, Leica, Panasonic and Sigma, has a large inner diameter of 51.6 mm that enables extremely fast lenses and compact dimensions. Panasonic says the configuration of the lens-to-camera communication interface is ‘future-proof’ and the L-Mount also offers an option for the construction of sealed systems that are resistant to dust and moisture. The Lumix S 24-105mm f/4 Macro OIS supports 0.5x macro shooting with a minimum focusing distance of 30cm. Its optical design consists of 16 elements in 13 groups, with two aspherical lenses and two ED (Extra-low Dispersion) lenses for suppressing chromatic aberration and achieving high resolution. The filter diameter is 77mm, and the lens has a 9-blade circular aperture diaphragm. A high-precision linear motor achieves sensor drive at a maximum speed of 480 fps for fast autofocusing. A special mechanism suppresses focus breathing. (Never heard of focus breathing? Don’t feel jargon-challenged – we hadn’t and we don’t! Apparently it’s a tiny change in focal length when the focal distance is changed. But good that it’s being supressed, we guess.) The RRP for this lens is $1899. The Lumix S Pro 70-200mm f/4 OIS, along with the Lumix S cameras’ 5-Axis stabilisation enables handheld shooting at telephoto focal lengths. The lens design comprises 23 elements in 17 groups and includes an aspherical lens and three ED (Extra-low Dispersion) lenses for suppressing both axial chromatic aberration and chromatic aberration of magnification. The filter diameter is 77mm, with a 9-blade circular aperture diaphragm. A focus clutch mechanism enables instant AF/MF switching and accurate manual focusing. The lens also excels in video recording performance with a mechanism that suppresses . The RRP for this lens is AU$2499. The Lumix S Pro 50mm f/1.4 is a fast prime lens with 13 elements in 11 groups. Two aspherical elements and three ED (Extra-low Dispersion) lenses effectively suppress both axial chromatic aberration and chromatic aberration of magnification, as well as correcting astigmatism. A double focus system combining a linear motor and stepping motor achieves sensor drive at up to 480 fps for fast, high-precision AF. A focus clutch mechanism enables instant AF/MF switching and accurate manual focusing. Thankfully, focus breathing is suppressed in this one, too. Like the other two, the nifty 50 also accepts 77mm diameter filter but it has an 11-blade circular iris diaphragm. RRP is $3599.